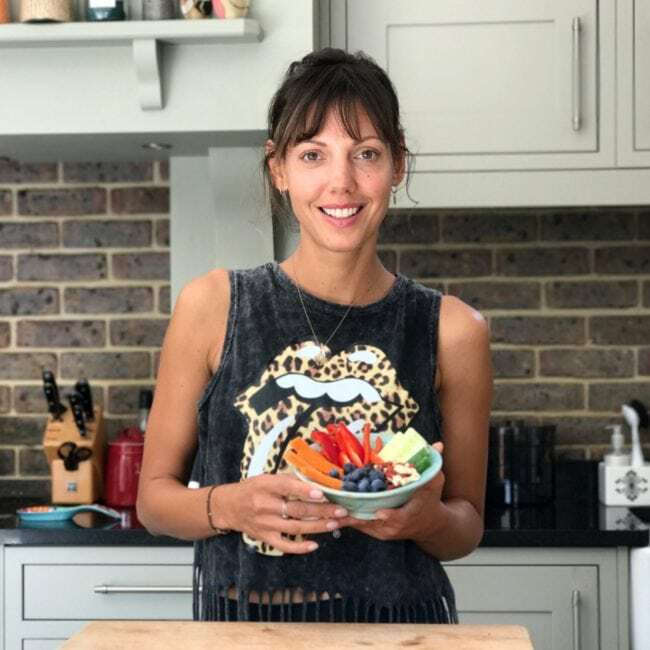 It was when Jackie, a guest at one of my Superfood Supperclubs, was talking about her husband Rob and how he dramatically improved his wellbeing by crafting his very own recovery plan, that I had the idea to interview and write about people that have made a huge difference to their own lives by actively taking part in their recovery and wellbeing. So the idea of the #WellnessWarrior series was born in which I want to inspire you through other people’s stories – people who took control over your own lives, their mental and physical wellbeing. Because we CAN, because it doesn’t need to be hard and simply because we’re worth it! When Rob and I met for the second time on a sunny afternoon, he swung off his bike, full of energy and open enough to talk about his illness, journey and passion about living a healthy lifestyle. Rob, 52, heads fundraising campaigns for big charities and lives in Surrey with his wife Jackie and three children. He enjoys keeping fit and has just come back from a cycle ride to Paris and I couldn’t help but wonder what could possibly be wrong with him. In Rob’s case the inflammation in his intestine was significant and interfering with his bladder making surgery the only real option. This followed by a course of steroids restored his sense of wellbeing and all was pretty good for about 20 years, so Rob just ‘got on with it’ again. Until the Crohn’s returned and his only choice became medication to suppress the immune system (immunosuppressants). As there was no obvious benefit and quite a bit of possible downside associated with suppressing his immune system with daily medication for an indefinite period which didn’t sit so well with Rob, he decided after several months of procrastinating to see a consultant privately who could help him. This had come from a recommendation from a fellow sufferer whose life had seemingly been transformed through a change of diet. To me, this is the crucial part of Rob’s journey. Instead of just accepting possible lifelong medication, Rob went on a mission to look for further ways of helping with his disease. 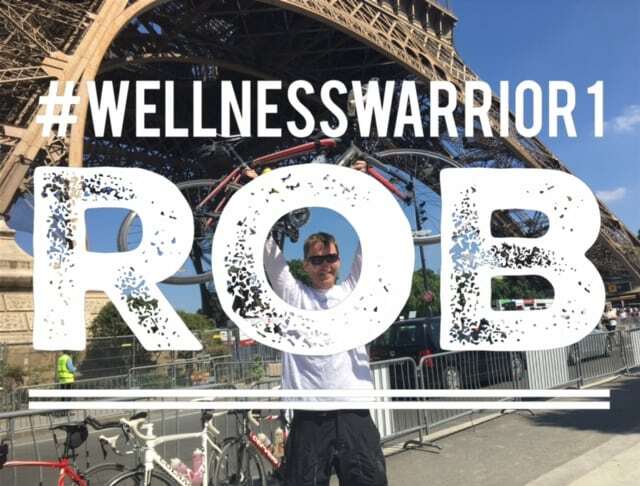 This marked his turning point, Rob embarked on his journey as a #WellnessWarrior. Rob paid for various blood tests and consultations with this doctor. After the initial consultation, he was put onto a yeast and sugar free diet. “It just made sense to me, if there is an inflammation in the gut then surely there are foods that can calm or aggravate it” explains Rob. With his wife’s support, Rob eliminated all refined sugar from his diet and yeast, started to support his gut with probiotics and to his and everybody’s surprise it only took 10 days until he started to feel considerably better with much improved bowel movements. After several months he took the decision to come off his immunosuppressants. For several years now Rob has been able to stay off prescription drugs and lives a healthy life with plenty of energy for his sport and family activities. He has also barely missed a day off work through illness. He has regular screenings with his NHS specialist to make sure that everything is ‘under control’ and has the occasional iron transfusion to keep levels topped up. Rob’s story inspired me so much as he actively took part in his recovery and wellbeing – and it’s paid off! It would have been easier in a way to just stick with the prescription drugs because to ‘think outside the box’ and to look for alternatives is always the harder way. What worked for Rob will not work for everybody as Crohn’s disease is a very individual condition with symptoms and possible causes varying greatly from person to person. But Rob’s attitude towards taking an active part in his state of being – to look after himself, to take control over his life and to look at food as the correct fuel for his individual machine, his body – this can certainly work for all of us and it is this that I want to share with you. Rob’s go- to breakfast are filled buckwheat pancakes…click here for the full recipe! I hope you feel as inspired as I do – Thank you Rob for sharing your story! P.S. : If you know someone who would also like to share their own story then please put them in touch with me. Let’s continue to inspire each other! If you are affected by Crohn’s disease or you would like more information visit www.crohnsandcolitis.org.uk Dietary changes should only be made when supervised by a health care professional as these will be highly individual to everybody.